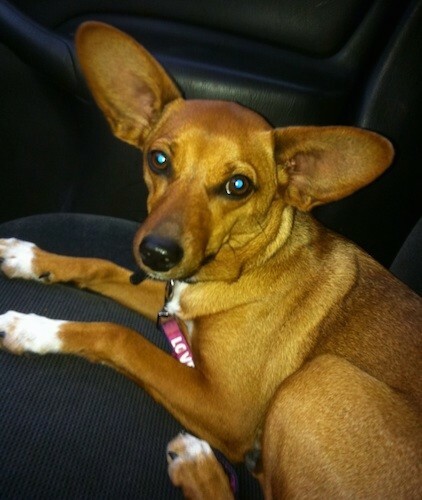 "Penny is a two year old Papillon-Miniature Pinscher mix. This rescue baby was a firecracker even when I first met her, 8 weeks old, at the city pound. Energetic, alert, loyal and inquisitive, Penny is very canine intelligent and instinct driven. She was incredibly easy to potty and kennel train (with consistency, praise and play as a reward), but her favorite place to sleep is curled up under the blankets by your feet. Penny has lived with me in an apartment in a one dog atmosphere but now thrives in a two dog home with a large fenced in backyard where she can get into mischief. Leggy and sturdy at under 20 pounds, Penny handles new situations with an ear for her master's command but has a nose for trouble at home. A fan of chewing up pencils, pens, and tissues, she can be quite sneaky but quick to wiggle and kiss her way back into your good graces. Ever the companion, if she isn't tailing me she's pestering Alfie, my 6 year old Schnauzerpoo, who abides her jocund antics. Penny is the best at giving a warmhearted kiss or a soulful gaze exactly when needed. I never thought love could be bought but $40 bought me my best friend."